The Trump tax cuts were pitched as a boon to US workers, with the administration arguing their benefits would trickle-down into rising wages. While the tax cuts have meant some Americans are keeping more of their paychecks, no discernible gains in wages have materialised thus far. Real average hourly earnings (adjusted for inflation) for all employees on private nonfarm payrolls were totally unchanged in June from one year earlier. President Donald Trump’s massive tax cuts were pitched by the administration as pro-worker, despite extensive analysis documenting the vast majority of benefits would accrue to the wealthiest Americans and the corporations they run. Now that enough time has elapsed since the passage of the tax cuts for economists to begin analysing the data, it’s clear that while many Americans may be seeing a bit more money in their paychecks as a result of the new tax breaks, the promised wage growth and business investment have yet to materialise. Real average hourly earnings the approximately 80% of workers categorized as “production and nonsupervisory employees” edged 0.2% lower over the same period. Real median weekly earnings have also decreased slightly. Trump talked up the second quarter’s strong 4.1% annualized pace of US gross domestic product growth, but most economists expect that number to come down closer to the recent 2% trend – and that’s without the drag from worsening trade wars. 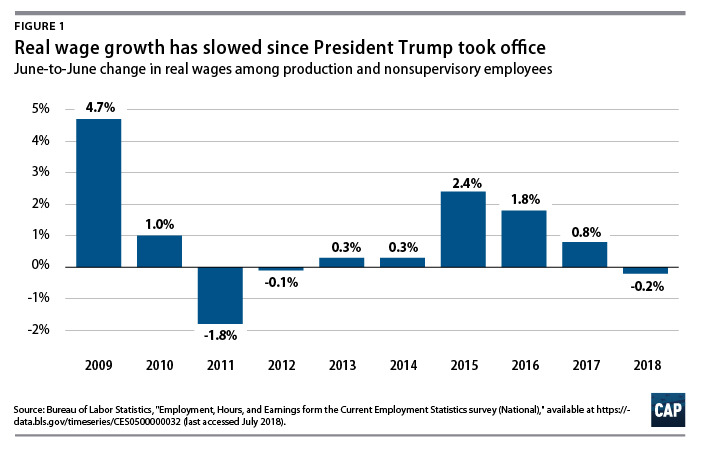 “Workers are not getting ahead in the Trump economy,” write CAP economist Michael Madowitz and senior fellow Seth Hanlon in a report. The 2% gain in nominal weekly median earnings from the second quarter of 2017 to the second quarter of 2018 was outpaced by inflation, which registered 2.7% over the same period, they note.